When dog trainer Abby Cline enters a rescue shelter she doesn’t just see lovable strays, she sees potential. Cline has worked with Stunt Dog productions since 2009. With them she spends nine months out of the year travelling in her RV nicknamed Babzilla with nine stunt dogs performing at fairs, festivals, theme parks and various other events including halftime shows. This summer she and her pack are contracted to do shows in both Branson Missouri and Valley Fair. When not on the road she spends her winters in Florida. Stunt Dog productions started in 1999 and is a family-owned business started by the Perondi family and is based out of California. Cline leads one of two full-time touring units that travels throughout the United States and Canada. According to their website, they have done more than 8,000 shows since its inception, and is one of the largest touring animal acts in the world. 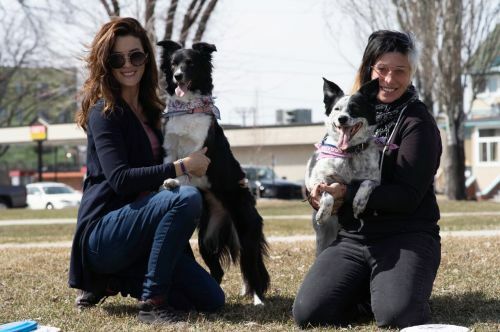 Cline’s passion for dog training started with a rescue dog who liked to play frisbee, wanting to compete, she eventually completed a six month dog training apprenticeship, where she and her dog stayed and trained with their mentors on an 18-acre farm in Michigan called Pawsitivevybe. 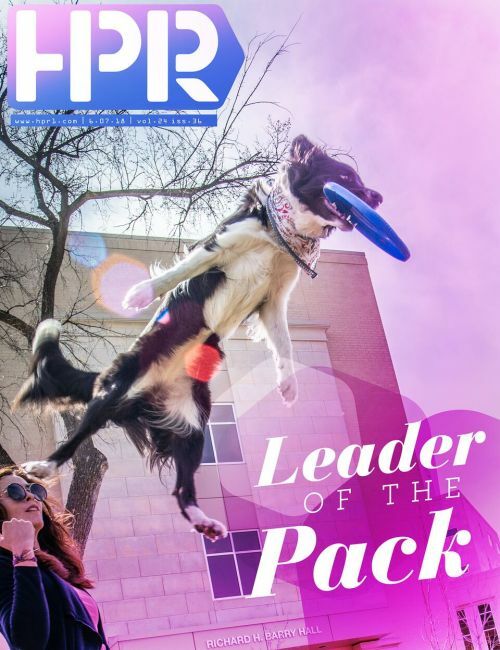 Her initial intent was to train and compete with her dog in hopes of improving their game and or gain titles in various frisbee competitions around the world. After her internship she opened her own training business called Pawsitivevybe Fargo, which she ran from 2009-2015. 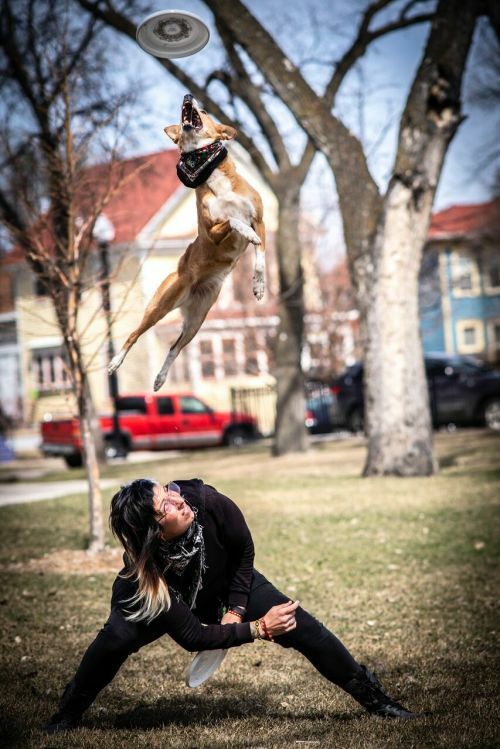 As she earns titles at various competitions with her stunt dogs, she trains to entertain. With toy and treat incentives her dogs are known for their frisbee agility and high jumping. They are known to jump rope and ride a tricycle. She even has a trick pug that will do a handstand in the palm of her hand. The dogs are slim and trim to which she attributes a healthy workout and practice regimen that also also includes swimming. When asked what made her choose a life as a travelling dog trainer, she joked. Now Abby, a 2003 Moorhead High school grad and MSUM alumnus, has taken on an apprentice of her own. Stavit “Stabby” Budin of Haifa, Israel reached out to her via Facebook. Budin had become acquainted with Cline’s work through various videos that she had found online and had even took a few lessons from Cline online. Now she and her three-year-old border collie Alexa have spent the past three months in the United States to learn and train under Cline. When we had a chance to speak with these two women they had already toured coast to coast. When she returns to Israel she hopes that she and Alexa can compete in the USDDN Dogfrisbee European Championship in Slovakia in August. When asked what Budin’s favorite part of the country was she mentioned Georgia, Phoenix and… Sioux Falls? “There were very big green fields and it was very quiet and very peaceful. A lot of place to train frisbee dogs,” she said. With all of this talk about frisbees I couldn’t help but wonder if there was a difference in dog frisbees and human frisbees. Budin said, “Human frisbees are much bigger and much wider. Dog frisbees are suitable for the dog’s mouth. They’re smaller and thinner and they’re made from a different plastic.” Much like human frisbees, they vary by weight. The two swung by the office and did a short demonstration, Budin with her faithful Alexa and Cline with three medium-sized dogs patiently waiting in their air conditioned van. As each dog prepared for their tricks the women made sure the dogs were properly warmed up before they demonstrated feats of agility and coordination. 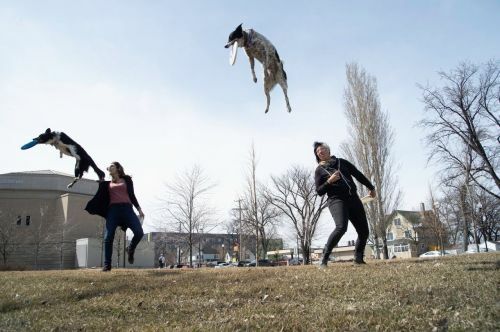 As Cline and Budin threw their frisbees their dogs seemed to sail effortlessly through the air. Budin would do cross steps as if line dancing and Alexa would dutifully mimic her. At one point both women lie on the ground with their feet in the air while their dogs balanced on their hind legs. Cline’s dog Doc whimpered slightly but diligently balanced. Cline told us that the dogs she had with her were the dogs that needed the most work, and she had left the rest of the dogs with her mother in Sioux Falls, but she could have fooled us and the crowd that had started to gather.